On the left, at 213 Caroline Street is the former residence of Dr. John I. Howe. Dr. Howe was born in Ridgefield in 1793, and graduated from the Medical University of New York. He was a resident physician in the New York City Almshouse, where he saw how pins were made by English inmates, and thought that such pins could be manufactured by machine. In 1829, he withdrew from the practice of medicine, after he and Lemuel Wellman Wright had invented the first practical all-automatic pin-making machine. Before this machine, it took 18 different operations to form one pin, and a package of handmade pins cost $1.00! With their success, the Howe Manufacturing Company was opened in New York in 1835, with Dr. Howe as general agent. In 1838, attracted by the water power, Dr. Howe moved the company to Birmingham, and by 1842 he had perfected the solid-headed pin. 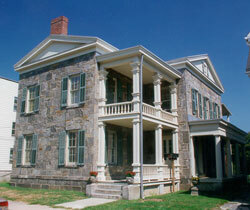 His home is believed to have been built by Lucius Hubbell, who built many stone dwellings in Derby and Shelton. The later Howe Pin Company management was a leader in providing Christmas bonuses based on profit sharing to company employees. The house will become home of the Lower Naugatuck Valley Industrial Heritage Center; where the Derby Historical Society's extensive collection of Industrial Era artifacts will be properly displayed. Future educational programs will include student hands-on programs that will introduce the Industrial Revolution and the Valley's active role in this period. At the stop sign just past the Howe House, turn right on Fifth Street. At the top of the hill at the stop sign, turn left onto Minerva Street. the Green will now be on your right.